Department of Food Technology, Kaunas University of Technology, Radvilėnų pl. 19, Kaunas LT-50254, LITHUANIA. Université Fédérale de Toulouse Midi-Pyrénées, INP-ENSIACET, Laboratoire de Chimie Agro-industrielle, Toulouse, FRANCE. Faculty of Medicine, Kauno kolegija / University of Applied Sciences, K. Petrausko st. 15, Kaunas LT-44162, LITHUANIA. Laboratoires Agronutrition SAS, Parc Activèstre, 31390 Carbonne, FRANCE. The structures of bioactive compounds present in Tussilago farfara (T. farfara) leaves (L) and roots (R), to our knowledge, are not elucidated in the literature. This study investigated the composition of bioactive compounds and their antioxidant activity (AA) extracted from L and R of T. farfara aromatic plant collected in Lithuania (LT) and France (FR). Three in vitro antioxidant methods (DPPH, ABTS and FRAP method) were used to evaluate radical scavenging activity (RSA) of total phenolic compounds (TPC), flavonoids and flavonols compounds. Modern chromatographic and spectrometric analysis techniques were used; On-line LC-MS technique was used to identify bioactive compounds in L and R extracts, while On-line HPLC-UV-DPPH• was used to evaluate the RSC of each bioactive. Extracts contain high amount of TPC with very good RSC. Eight bioactive compounds were identified in T. farfara L and R extracts, two of them (quercetin-pentoside and kaempferol-glucoside) previously not reported in this plant. Also, results showed that dicaffeoylquinic acids and quercetin pentoside were the major radical scavengers in L and R extracts. The present study provides new information about the chemical composition, bioactive structures and RSC of T. farfara L and R extracts from two geographical origins (Lithuania and France). This study demonstrate that T. farfara leaves and roots is a resource of bioactives which can reduces the risk of diseases and its effects which correlated with the antioxidant compounds. Interest in natural products has become increasingly important in recent years. This interest manifests itself in a growing demand for bio-free natural products with no harmful effects for human, animals and environment. Many medicinal plants contain large amounts of antioxidants such as polyphenols, which can play an important role in adsorbing and neutralizing free radicals, quenching singlet and triplet oxygen, or decomposing peroxides. Despite several published reports dealing with bioactivity of isolated compounds from flowers or buds of T. farfara plant, very few information was found about bioactives composition, structure and their AA from L and R extracts. Beside, to our knowledge, no previously studies were carried on L and R extracts of T. farfara plant from LT and FR origins. 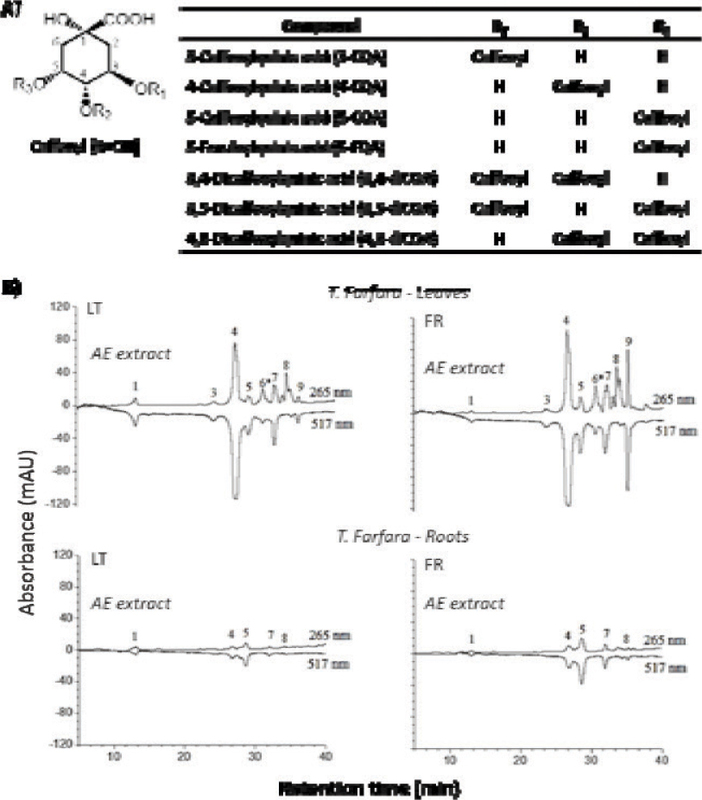 This study aims i) to screen the TPC, flavonoids, and flavonols present in L and R extracts of T. farfara plant and evaluate their antioxidant properties in several methods (DPPH, ABTS, FRAP), ii) to identify the structure of these phenolics and evaluate their AA by analytical techniques, iii) to investigate the effect of geographical site (LT and FR) on the chemical profile and AA of identified compounds. Acetone (analytical grade) was from Stanchem (Lublin, Poland), ethanol (rectified spirit 95%, Stumbras, Lithuania) and methanol (analytical grade) were from Fluka Chemie (Buchs, Switzerland) were used isolated non-volatile extracts from hydrodistillation residue. Acetonitrile (HPLC grade), methanol (HPLC grade), acetic acid (HPLC grade), were used for HPLC analysis. Gallic acid, rutin, 2,2-diphenyl-1-picrylhydrazyl hydrate (DPPH•, 95%), 2,6-di-tert-butyl-4-methylphenol (BHT), anhydrous sodium sulphate and phosphate buffered saline (PBS) were from Sigma-Aldrich (Steinheim, Germany). Trolox® (6-hydroxy-2,5,7,8-tetramethylchroman-2-carboxylic acid), (97 %) was from Acros Organics (Geel, Belgium). Folin-Ciocalteu’s phenol reagent, 2,4,6-tripyridyl-s-triazine (TPTZ), 2,2’-azinobis(3-ethylbenzothiazoline-6 sulfonic acid) diammonium salt (ABTS•+) were from Fluka Chemie (Buchs, Switzerland). Commercial refined sunflower oil “Vilnius” (Vilniaus AB “Aliejus”, Lithuania). KCl, NaCl, NaH2PO4, K2S2O8 (Merck, Darmstadt, Germany). KH2PO4 (Jansen Chimica, Beerse, Belgium) were used to evaluate antioxidant properties in the residues extracts. The leaves and roots of T. farfara were collected in Midi-Pyrenèes - south-west of France (43° 36′ 16.2″ N/ 1° 26′ 38.4″ E) in July 2011, and in Kaunas Botanical Garden of Vytautas Magnus University - Lithuania (54° 52′ 14″ N/ 23° 54′ 40″ E) in August 2010 after flowering vegetation phase. Acetone (AE), methanol (ME) or ethanol (EE) extracts from T. farfara L and R were obtained by extracting 15 g of dry crushed L and R with 200 mL of AE, ME or EE during 3 h in a Soxhlet apparatus. The extracts were concentrated in a R114 vacuum rotavapor equipped with a B480 water bath (60°C) and B169 vacuum pump (Büchi, Switzerland). The content of TPC in extracts was determined with Folin–Ciocalteu reagent.8 Calibration curve was prepared by using 1 mL reference Gallic acid solutions in ethanol (0.025, 0.075, 0.100, 0.175 and 0.350 mg/mL), which were mixed with 5 mL of a standard Folin-Ciocalteu reagent and diluted with distilled water (1:10) and 4 mL of 7.5% sodium carbonate solution in distilled water. The absorption was read after 30 min at 765 nm. The concentration of TPC was expressed in mg of Gallic acid equivalents (GAE) per g of plant extract. The percentage of flavonoids was measured using rutin as a reference.9 One mL of plant extract solution in 95% ethanol (10 g/L) and 1 mL of aluminum trichloride solution in 95% ethanol (20 g/L) were pipetted into a 25 mL volumetric flask and made up with 95% ethanol. The absorbance was read at 415 nm after 40 min at 20°C. Blank samples were prepared from the mixture of 1 mL of plant extract and 1 drop of diluted acetic acid. The absorbance of a reference solution, which was prepared by using 1 mL of rutin solution instead of plant extract, was measured simultaneously. Rutin solution was prepared from 0.05 g of dried at 130-150°C for 3 h rutin, which was diluted in 100 Ml of 95% ethanol. All determinations were performed in triplicate. The percentage of flavonoids in plant extracts was calculated by formula: X= (A×m0×100×10)/(A0×m×100), where A is the absorbance of extract; A0 is the absorbance of rutin; m is the weight of pure extract (g); m0 is the weight of rutin (g). The content of flavonols was determined by the previously reported method.10 Series of reference rutin solutions containing 0.05, 0.1, 0.15, 0.2, 0.3, 0.4, and 0.5 mg/mL of rutin were prepared. Two mL of reference were mixed with 2 mL of aluminum trichloride solution (20 g/L) in 95% ethanol and 6 mL of sodium acetate solution in ethanol (50 g/L) were added. The absorbance was read at 440 nm after 2.5 h at 20°C and the calibration curve on the dependence of the absorbency on the concentration of rutin was drawn. Plant extract samples were prepared under the same conditions by using 2 mL of extract (10 g/L) in 95% ethanol instead of rutin. All determinations were performed in triplicate. The percentage of flavonols was calculated by the formula: X=(C×V×100)/(m×100), where C is the concentration of rutin, determined form the calibration curve (mg/mL); V is the volume of plant extract (mL); m is the weight of pure plant extract (g). The RSC of T. farfara extracts against stable 2.2-diphenyl-2-picrylhydrazyl hydrate (DPPH•, Sigma-Aldrich Chemie, Steinheim, Germany) was determined on a UV/Vis spectrophotometer Spectronic Genesys 8 (Rochester, USA) at 515 nm by a slightly modified method of Brand Williams and co-workers.11 Extract solutions were prepared by dissolving dry T. farfara extract in ME. The solution of DPPH• in methanol (6.5×10-5 M) was prepared daily before measurements. Two mL of this solution were mixed with 50 μL of extract solution in a 1 cm path length microcuvette and after 30 min the decrease in absorbance was read. Blank sample with the same amount of methanol and DPPH• was prepared and measured daily. The RSC was calculated by the following formula: I= [(AB -AA) / AB] ×100, where I is DPPH• inhibition, %; AB is the absorbance of a blank sample (t=0 min); AA is the absorbance of extract solution (t=30 min). The amount of extract required to decrease the initial DPPH• concentration in the reaction by 50% is referred as an effective concentration, IC50. The measurements were carried out in triplicate for each solvent. The RSC of extracts was also measured by ABTS•+ radical cation assay.12 Stock solution of ABTS (2 mM) was prepared by dissolving in 50 mL of phosphate buffered saline (PBS) obtained by dissolving 8.18 g NaCl, 0.27 g KH2PO4, 1.42 g Na2HPO4 and 0.15 g KCl in 1 L of ultra-pure water. If the pH was lower than 7.4, it was adjusted with NaOH. Ultra-pure water was used to prepare 70 mM solution of K2S2O8. ABTS•+ radical cation was produced by reacting 50 mL of ABTS stock solution with 200 μL of K2S2O8 solution and allowing the mixture to stand in the dark at room temperature for 15–16 h before use. The radical was stable in this form for more than 2 days when stored in the dark at room temperature. For the assessment of extracts, ABTS•+ solution was diluted with PBS to obtain the absorbance of 0.800±0.030 at 734 nm. Three mL of ABTS•+ solution were mixed with 30 μL ethanol solution of T. farfara extract in 1 cm path length microcuvette. The absorbance was read at ambient temperature after 1, 4, 6 and 10 min. PBS solution was used as a blank sample. All determinations were performed in triplicate. The percentage decrease of the absorbance at 734 nm was calculated by the formulae: I= [(AB-AA)/AB] ×100, where I is ABTS•+ inhibition, %; AB is the absorption of blank sample (t=0 min); AA is the absorption of extract solution (t=10 min). The RSC was expressed as a percentage of inhibition of Trolox (6-hydroxy-2.5.7.8-tetramethylchroman-2-carboxylic acid) mM equivalent per 1000 g using prepared calibration curve. The extent of quenching of ABTS•+ radical by extracts was compared with standard amounts of Trolox. The concentrations of Trolox standard used for calibration curve were 0.001, 0.01, 0.1, 0.5, 1, 1.5 mM/L. The ability of plant extracts to reduce ferric ion (FRAP assay) is another indicator frequently used for assessing antioxidant power.13 Ferrous ion (Fe2+) produced in this assay forms a blue complex (Fe2+/TPTZ) absorbing at 593 nm. Briefly, the reagent was prepared by mixing acetate buffer (300 mM, pH 3.6), a solution of 10 mM TPTZ in 40 mM HCl, and 20 Mm FeCl3×6H2O at 10:1:1 (v/v/v). Firstly, 300 μL of freshly prepared FRAP reagent was heated to 37°C and an absorbance (A0) of a blank reagent was read at 593 nm in a Biotek EL808 microplate reader (Vermont, USA). Then 10 μL of 0.1% extract solution in water and 30 μL H2O were added (final dilution of samples in the reaction mixture was 1:34) and the absorbance (A) was recorded every 1 min during the whole monitoring period which lasted up to 30 min. The change in the absorbance (ΔA593 nm) between the final reading and A0 was calculated for each sample and related to the ΔA593 nm of a Fe2+ reference solution which was measured simultaneously. The extracts were analyzed on a HPLC/UV system supplemented with DPPH• radical scavenging detector. Two chromatograms were recorded simultaneously, one of which representing UV absorbance of effluent at 265 nm prior to the reaction, while a mirror chromatogram was obtained at 517 nm after reaction of the effluent with DPPH• solution in the reaction coil. The mobile phase was supplied to the column by a model 9012 HPLC gradient pump (Varian, USA) at a flow rate 0.75 mL/min. The samples (20 μL) were injected into the HPLC system by means of Cheminert C1 injector (Valco Instruments, USA). Reversephase LiChroSpher RP-18e 5 μm 12.5×0.4 cm column and 0.5×0.4 cm precolumn (Merck, Germany) were used for separation. The DPPH• reagent was prepared by dissolving 0.01 M DPPH• in 0.1 M sodium citrate buffer (pH=7.6), methanol and acetonitrile (50:25:25 v/v). It was continuously supplied into a reaction coil (3 m of 0.25 mm id fusedsilica capillary) by a model 2200 HPLC pump (Bischoff, Germany) at a flow rate of 0.75 mL/min. The signals were acquired at 265 and 517 nm wavelengths by means of Linear 206 PHD and Linear UVIS 200 UV-VIS detectors, respectively. Solution A (bidistilled water with 0.05% TFA) and B (methanol with 0.05% TFA) were used as a mobile phase components for gradient elution. The extracts were separated using the following gradient: 10% of B at 0 min, 25% of B at 5 min, 40% of B at 25 min. 95% of B at 40 min. 95 % of B at 43 min and 10% of B at 44 min. Clarity chromatography software (DataApex. Czech Republic) was used for data acquisition. LC system consisted of a Thermo-Fisher Spectra System (TFSP, San Jose, CA) P1000XR pump, a TFSP 6000LP Photodiode Array Detector and a TFSP AS 3000 auto-sampler. Separation of compounds was performed on a Varian Pursuit XRs 5 C18 column (250 mm×4.6 mm ID, 5 μm) using a linear gradient of 0–30 min., 3–97% of acetonitrile (A) to bi-distilled water with 0.1% TFA (v/v) (B), 30–35 min., 20–80% of A to B, 35-45 min., 3-97% of A to B. Flow rate was 1 mL/min and 10 μL of the sample was injected. Mass spectra were acquired using a Thermo-Fisher LCQ mass spectrometer (Finnigan MAT, San Jose, CA) equipped with an atmospheric pressure chemical ionization source (APCI) using both positive and negative ion mode. The APCI source operating parameters were as follows: the capillary and APCI vaporizer temperatures were set to 250°C and 450°C, respectively, and the spray was stabilized with nitrogen sheath and auxiliary gas (80 and 25 arbitrary units, respectively). Discharge current was 5 μA and capillary voltage was +15 V and −15 V in the positive and negative ion mode, respectively. The mass spectra were acquired in the data dependent mode with wideband activation (i.e. the most intense ion obtained for each scan in the full mass spectrum is further submitted to 38% collision energy for MS/MS). For antioxidant activity measurements, mean values and standard deviations were calculated from at least three replicates using MS Excel 2003. Statistical analysis was performed by using one-way analysis of the variance (ANOVA), followed by the Duncans’ post hoc test to compare the means showing significant variation (p<0.05). All the data were subjected to variance analysis using the GLM procedure of SAS.14 Analyses were performed using MSStat (ANALYT MTC, Muehlheim, Germany, MS Statistical Software Version 3.02u); looking for differences in the plant origins. The content of TPC was determined from regression equation of a calibration curve (y=8.3166x + 0.2207, R2;=0.9985) and expressed in Gallic acid equivalents (GAE) in T. farfara extracts. TPC in leaves (L) and roots (R) were determined from two origins (Lithuania LT and France FR). Various solvents (EE, ME and AE) were used to achieve extraction of active substances with diversity in their polarity. All T. farfara L extracts contain more much TPC then R extracts from both LT and FR origins (table 1). The highest concentration of TPC was in L EE extract (204.57±1.54 mg GAE/g) from FR origin, while for LT origin ME L extract has highest TPC concentration (157.25±0.08 mg GAE/g). The ME extracts of R have higher concentration of TPC, than EE and AE extracts. However, the sums (AE+ME+EE) of TPC in both anatomical parts (L and R) of T. farfara were different from LT and FR origins (489.01 and 583,97mg GAE/g respectively). For LT and FR the sums (AE+ME+EE) of L extracts, the TPC were 403.60 and 487.81 mg GAE/g respectively, while for R extracts, the TPC sums (AE+ME+EE) was 86,01 and 96,52 mg GAE/g respectively. Therefore, high amount of TPC in L extracts showed very good RSC, while the content of TPC in R extracts, possessed lower RSC. So far as acetone and alcohol were used as consecutive extraction solvents it may be suggested that individual phenolic compounds are present in the plants of two origins at different proportions. Results of the present study showed that acetone does not provide exhaustive extraction of phenolic compounds; polar solvent should be applied as a second solvent. It can be observed that the content of phenolics in L and R extracts correlates with their antiradical activity; strong correlation was observed between total phenolics and FRAP in R extracts (R2=0.834 and R2=0.793 respectively), also we found correlation between TPC and DPPH• for R extract (R2=0.696) and TPC with ABTS•+ assay in L extracts (R2=0.553), confirming that phenolic compounds are important contributors to the antioxidant properties of these extracts. However, the correlations between DPPH•, FRAP in L extracts were very weak, less than 0.5. Flavonoids are important group of phenolic compounds; therefore, their concentration was assessed separately, by exploring the ability of flavonoids to form yellow color chelate type internal complexes with Al3+, which may be measured spectrophotometrically. The amounts flavonoids and flavonols extracted from L and R of T. farfara were analyzed. The highest amounts flavonoids and flavonols were found in LT origin plants for both anatomical parts than in FR origin. It is important to note that the climatic conditions in the countries were very different; mean temperature and rainfall amount during the month of collection were higher in Midi-Pyrenèes-France (10.5°C and 97.1 mm) than in Kaunas-Lithuania (6.9°C and 34.0 mm). These factors may be among the reasons of the differences in chemical composition. High concentrations of flavonoids were determined in L extracts, than R extracts. The highest flavonoid content was found in the AE extract from the the ME extracts from the L (12.16 and 11.02 mg RE/g). The IC50 values for DPPH radical scavenging activity of T. farfara anatomical parts were the lowest for FR R AE extract (0.88 mg/mL), and LT R AE extract (0.54 mg/mL), the highest AA were in FR L AE extract (0.05 mg/g) (Figure 1). The ferric reducing power (FRAP) assay of the different parts of the plant extracts was in the range of 0.52-0.77 mg Fe(II)/mL in LT extracts and 0.47-0.68 mg Fe(II)/mL in FR extracts. For leaves extracts relationships between ABTS•+ and FRAP did not find, LT L EE showed higher activity in ABTS•+ and lowest in FRAP reaction, the observed difference can be explained by different pH in the reaction media (pHFRAP=3.6 and pHABTS=7.4). Comparing AA indicators we observed that the T. farfara extracts isolated from LT and FR origin were different. The differences in climatic conditions (the amount of rainfall during plant development was nearly three times less abundant in Lithuania (340 mm) than in France (971 mm), the average temperature was also lower in Lithuania and it might have the impact on these differences; however, other factors, such as plant chemotype, soil, sunlight may also have the impact on plant properties and composition. Determination of the effects of these factors on T. farfara properties would require special experimental design. The on-line RP-HPLC-DPPH• method can be used for a rapid assessment of radical scavenging properties of separated in chromatographic column compounds which are present in complex mixtures such as plant extracts.19-23 Flavonoid glycosides, quercetin 3-O-β-L-arabinopyranoside and quercetin 3-O-β-D-glucopyranoside24 as well as quinic, chlorogenic and dicaffeoylquinic acids were reported previously in T. farfara flower bud extract from China.25 The on-line HPLC-DPPH• method was used for the detection of radical scavenging components. The R AE exhibited smaller peaks than those seen in the extracts of the L (Figure 3B). The analysis revealed that L and R extracts contain 5 similar active components: quinic acid, dicaffeoylquinic acid, quercetinpentoside and kaempferol-glucoside, while other detected compounds were different. The ESI-MS of the AE, ME and EE of T. farfara from two origins were qualitatively different. Compounds 3, 4 and 5 showed [M-H]-signal at m/z 515 with fragmentation at m/z 353 and 179, from which a molecular formula of C25H24O12 was assigned. The ion at m/z 353 indicated a chlorogenic acid fragment derived from the loss of a caffeoyl group. The ion at m/z 179 indicated fragments of caffeic acid moieties. These MS data indicated that the compounds 3, 4 and 5 were dicaffeoylquinic acid isomers (Fig.3B). As chromatographic separation was performed, it wasn’t possible to determine which isomers of dicaffeoylquinic acid were present, however all isomers are common components of T. farfara and possess antioxidant activity.25 Usually, the location of the caffeoyl groups in dicaffeoylquinic are at C-3’; C-4’, C-3’; C-5’ and C-1’; C-5’ (Figure 3A). TPC, flavonoids and flavonols of T. frafara leave and root extracts from different solvents. Superscript letters (a–b) indicate if the values for the extracts isolated with the same solvent from Lithuanian (LT) and French (FR) origin plants are statistically different (P≤0.05); Values are mean ± SD of triplicate measurements. 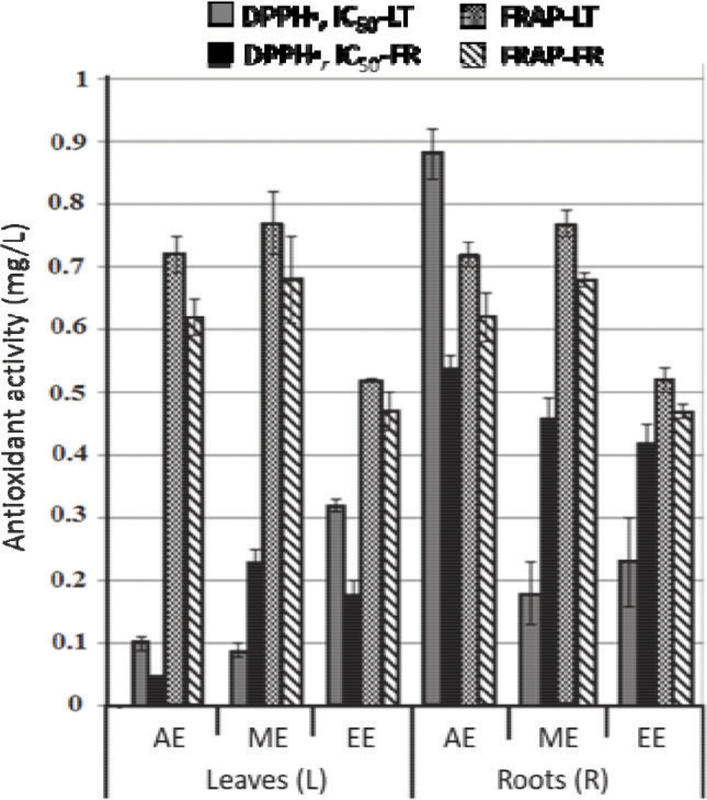 Ferric reducing/antioxidant power (FRAP) and DPPH radical scavenging assay of T. farfara leaves and roots extracts from Lithuania (LT) and France (FR). 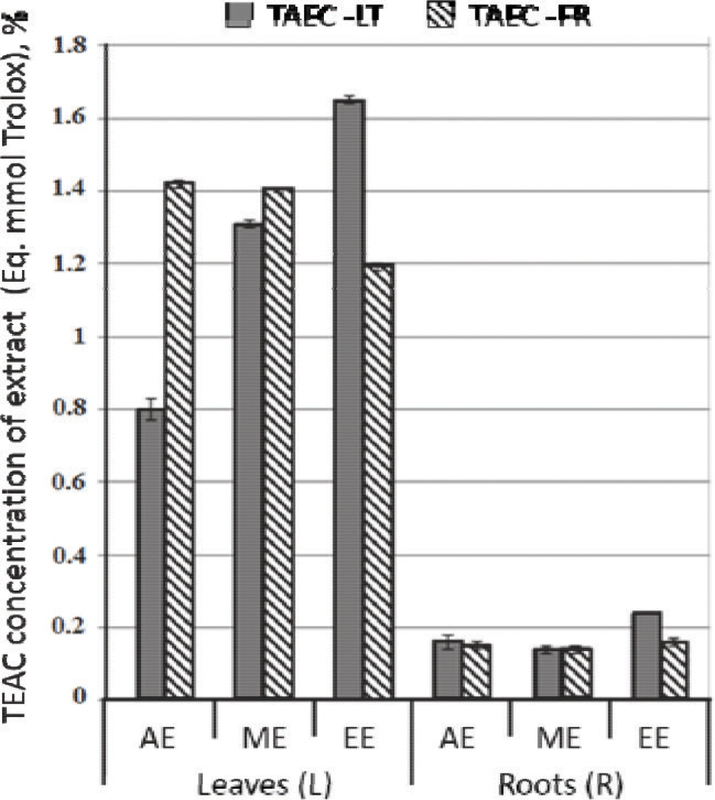 TEAC values in ABTS radical cation discoloration assay of T. farfara leaves and roots extracts from Lithuania (LT) and France (FR). On-line HPLC/DPPH• chromatograms of acetone (AE) leaves and roots extracts of T. farfara from Lithuanian (LT) and French origin (FR). The MS data of the T. farfara L extracts presented ions corresponding to peak 1: (m/z 191)-quinic acid, peaks 3, 4 and 5 : (m/z 515)-dicaffeoylquinic acid isomers, peak 6 : (m/z 609)-quercetin-3-rutinoside (rutin), peak 7 : (m/z 434)-quercetin-pentoside and peak 8: (m/z 447)-kaempferol-glucoside, peak 6*: (m/z 463)-quercetin-glucoside and peak 9 : (m/z 678) tricaffeoylquinic acid. However, these ions (m/z 463 and m/z 678) were not found in the MS data of roots extracts. Quinic acid, chlorogenic acid, rutinoside and dicaffeoylquinic acid isomers were previously isolated from the flower buds of T. farfara 5 while, to the best of our knowledge, quercetin-pentoside and kaempferol-glucoside were not previously reported in this plant. 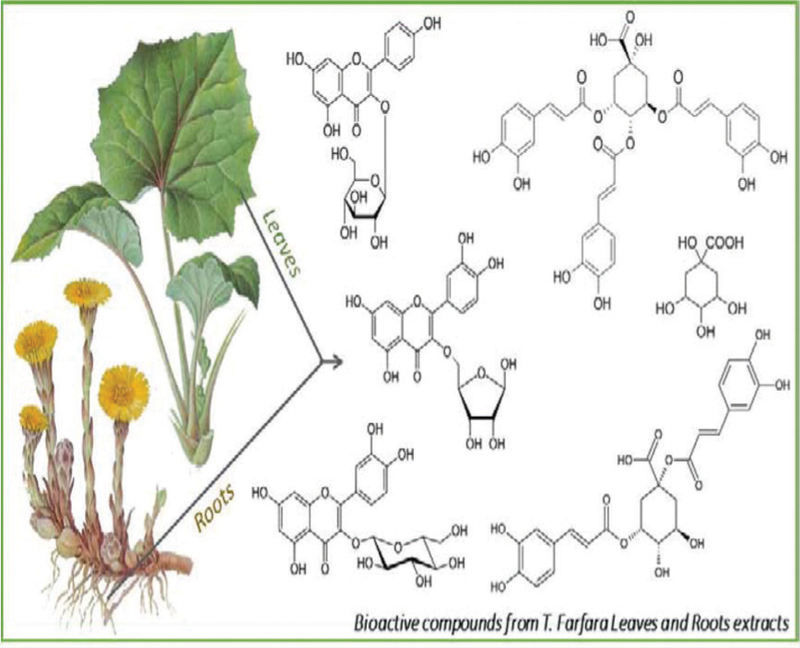 Bioactive compounds identified in leaves and roots of T. farfara plant and their radical scavenging capacity evaluated by the on-line HPLC-UV-DPPH• method. diCQA-dicaffeoylquinic acid, Q-3-O-glc-quercetin-glucoside, Q-pent-quercetin-pentoside, K-3-O-glc- kaempferol-glucoside, triCQA-tricaffeoylquinic acid. The present study provides new information about the chemical composition, bioactive structures and RSC of T. farfara L and R extracts from two geographical origins (Lithuania and France). Extracts contain high amount of TPC with very good RSC. However, L extracts possessed higher RSC than R extracts. Several antioxidants were identified in T. farfara plant by using modern chromatographic and spectrometric analysis techniques; eight and five antioxidant compounds were identified in T. farfara L and R extracts, respectively; two of them (quercetin-pentoside and kaempferol-glucoside) previously not reported in this plant. Also, results showed that dicaffeoylquinic acids and quercetin pentoside were the major radical scavengers in L and R extracts. Some differences were determined in the composition profile and RSC of identified bioactive compounds in T. farfara plant from Lithuanian and French origin proving that such factors as cultivation area, climatic conditions, vegetation phase, genotype and others may be important in the accumulation of active constituents in the plants. T. farfara L and R extracts examined in this study contain valuable functional constituents – antioxidants which can found wider practical application in different areas, particularly in formulation and production of food additives, functional food components and healthy supplements. The present study contains new information’s about bioactive compounds composition and antioxydant activity of T. farfara wild plant grown in France and Lithuania. Quercetin-pentoside and kaempferol-glucoside bioactives were identified for the first time in T. farfara plant. Dicaffeoylquinic acids and quercetin pentoside were the major radical scavengers in leaves and roots, which provides a scientific evidence for the consumption of leaves as tea infusion to prevent diseases. This Study suggests an interest for the practical implementation in terms of applications issues in formulation and production of food additives, functional food components and healthy supplements. The study was supported by Research Council of Lithuania (grants no. TAP47 and SVE-06/2011). The authors would like to thank Dr. O. Ragažinskienė (Kaunas Botanical Garden of Vytautas Magnus University, Lithuania) for providing plant material. 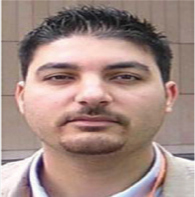 Dr Bachar Zebib, degree in phD of Physical-chemistry of materials (2006) from the Univerity of Pierre-Marie CURIE, Paris-France. 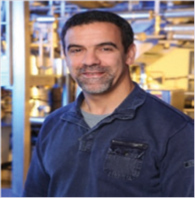 Currently, he is a scientific executive in nutrition and crop protection at Agronutrition company of the international DE SANGOSSE group. His reaserch interesets include natural bioactives, agriculture, materials science, agronomy, and formulation engeneering. He has six pattents, two books, more tehn twenty five original papers and more than fifty congress communications. Dr Othmane Merah, PhD, Associate Professor in Physiology of plants, Agronomy, Genetics at the Paul Sabatier University-Toulouse, France. Researches performed at the Laboratory of Agro industrials Chemistry focus mostly on accumulation of bio actives in plants. His research interests include accumulation of lipids, agronomic and genetic effects on these bio actives and their potential uses in industries, bio refinery, and abiotic stresses. He has written more than sixty original papers as well as review articles and book chapters on agronomy, genetics, lip chemistry, foods. Conflicts of interest CONFLICT OF INTEREST No conflict of interest are declared..
Keyword: New bioactive compounds from T. farfara plant were identified for the first time. This study demonstrate that T. farfara leaves and roots is a resource of bioactive compounds which can reduces the risk of diseases and its effects which correlated with the antioxidant compounds.